For some of us across the country, temperatures have already started to drop and it has become too cool to take a dip in that beautiful sparkling pool we worked so hard to maintain all summer. Right now it is very tempting to just call it quits, roll out the pool cover, and call the maintenance company to come out and get ahead of the curve on winterizing. Try to resist that urge a little bit longer because the fall is an absolutely wonderful time of year to own a pool. 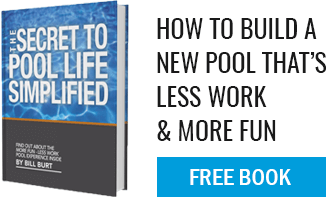 First of all, the costs associated with maintaining your pool are greatly reduced as temperatures drop. Less ambient heat and fewer hours of daylight mean you are burning off chlorine at a much slower rate, therefore not having to shock as often. The decrease in pool usage also means fewer additions to your water, like hair and sun block, that require increased filtration and chemical additions. Secondly, and most importantly, keeping your pool open into the fall means that it continues to be a source of entertainment for you, your family, and your friends. Depending on where you live and how much sun your pool gets, temperatures during the day may be warm enough to enjoy a quick dip all the way into October. Even if you do not choose to get wet, there are still many activities that the mere presence of a pool can enhance. Think about curling up on a pool chair with a warm blanket and a good book and listening to the sound of the water gently lapping against the sides. Or consider inviting friends over for an evening poolside BBQ and bring in a fire pit for everyone to sit around. The reflection of the firelight against a crystal clear pool with the sun going down can make for a memorable event. Lastly, consider installing certain amenities to your pool and poolscape that will enable you to enjoy the entire environment well into the fall and beyond. Pool heaters are wonderful additions that can extend the swimming months beyond the normal summer season. If you are feeling especially extravagant, consider installing a hot tub next to or near your pool. Hot tubs can be used all year round and the site of your clean and clear pool while relaxing in the tub after a long workweek can be backyard luxury at its best.